George Graham Reviews Koko Taylor's "Royal Blue"
Ever since Bessie Smith in the 1920s, women have always been part of the blues, but they have never had the high visibility or anywhere near the numbers on the scene as the blues men. The current revival of the style has raised the profile of blues women from popular performers like Bonnie Raitt, and even the teenaged Shannon Curfman, who has been attracting hype in the media; to veteran performers like Etta James and Lavelle White. But one surely one of the most stalwart and acclaimed women in the blues is Koko Taylor, who has just released her first new album in seven years, called Royal Blue. Following a classic path from humble beginnings near Memphis, Tennessee, Ms. Taylor, born Cora Walton, was orphaned by age 11, and together with her five brothers and sisters was attracted to music, hearing the blues on the radio and eventually attempting to make their own instruments. She got her nickname Koko from her fondness for chocolate. By age 18, she and her soon-to-be husband the late Robert "Pops" Taylor moved to Chicago's South Side with little more than the clothes on their back, and eventually found domestic work there. The Taylors would visit the ubiquitous blues clubs in their part of the Windy City and at Pops' urging, Koko began to take to the stage. By the early 1960s, she was heard by the legendary Chicago blues composer and bass player Willie Dixon, who had been writing songs for Muddy Waters and Howlin' Wolf. Dixon arranged for Ms. Taylor to get a recording contract with Chess Records, and produced several recordings for her, including her big hit Wang Dang Doodle, which sold a million in 1965. Since then, Ms. Taylor has not stopped, gradually building her following among wider audiences, and eventually winning the sobriquet "Queen of the Blues." Her style is no-holds-barred full-tilt electric Chicago blues, with an unmistakable voice and an energetic performing style and tireless touring that have brought her before audiences worldwide, and won her a Grammy Award and 19 W.C. Handy Blues awards over the years. Though she has been keeping active in touring, quite a bit of time elapsed since her last CD, and now she is finally out with an impressive new effort that also boasts some outstanding guest appearances, including B.B. King, Keb' Mo', the great blues and rock pianist Johnnie Johnson and one of the teenaged blues-rock sensations, Kenny Wayne Shepard. This album also shows some healthy songwriting output from Ms. Taylor, who is known mainly as an interpreter. But she also gathers songs from diverse sources, including Ray Charles and even Melissa Etheridge, to cover on Royal Blue. In addition to the well-known guests, she is joined by her regular band, who are one of the best groups she has had backing her, including Criss Johnson on guitar, who is an impressive player, Kenny Hampton on bass and Kriss T. Johnson, Jr. on the drums. Also appearing regularly is Dolpha Fowler, Jr. on the keyboards. Jazz saxophonist Mark Colby also makes a couple of appearances on the CD, making it probably the most stylistically diverse CD Ms. Taylor has recorded. Royal Blue even contains her first acoustic blues track. The first of the Koko Taylor originals is Don't Let Me Catch You (With Your Drawers Down), another set of lyrics on the perennial blues theme of infidelity. The song, inspired by the classic blues riffs of Willie Dixon's Spoonful, provides more grist for the band to turn in a great performance. 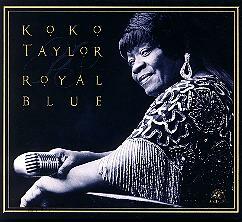 Koko Taylor has very much earned her title of Queen of the Blues. In a nearly forty year career of singing the rough-and-tumble Chicago electric style of the blues, where few women have feared to tread, Ms. Taylor has created some memorable recordings that capture the spirit of her music. Now working with an excellent band including guitarist Criss Johnson, Ms. Taylor has created her most diverse album yet, with interesting and generally outstanding guest appearances, bringing in some other facets of the blues, including an acoustic tune, plus some Memphis-style horns. It keeps the gritty energy level of classic Chicago blues while expanding her range. In terms of production and sound, the CD is also a class act. This is not subtle music, but the CD maintains worthy clarity while still being loud. Ms. Taylor's vocals jump right out of the speakers, and the guitar sounds have the right combination of crunch and clarity. Though it has been seven years since Koko Taylor's last album, her new CD Royal Blue shows her to be in top form and more adventurous musically. The result is a major event for blues fans.